A quick word about my last two weeks at LWO. Firstly, Merlin’s City Crossing Tour where I was absolutely right in having the Aig tunnel in Sudan as a second way of going under the River Pregel, thus obviating the need for my path to swerve above the middle of the first square of LONDON bridge. Although I don’t know for certain, I think the editors and marker would be absolutely right to mark it wrong! I mean, what a preposterous idea to have such an obscure tunnel as part of the solution. How I thought that it was the answer is still a mystery to me. As I said in my blog, how did Merlin come up with that obscure geographic feature. The answer, of course, is that he didn’t, and it highlights one of the main litmus tests of a Listener solution: If it doesn’t feel 100% right, it probably isn’t. And this didn’t, and wasn’t. I put my inability to see what should have been fairly obvious down to colouring the bridges’ squares in blue, rather than “marking them with a straight line connecting the centres of all its cells”. The preamble is there for a reason, and it’s written in a certain way for a reason. If I had done as I had been told, I might have got it right. Secondly, my absence from Listen With Others last week was not because I was still in a grump over the Bridges of Königsberg. It’s just that other events overtook me and I didn’t have time to write about Paul Wittgenstein and his lack of dexterity. All I have to say is that it took me ages to realise that RT was what was missing from three clues. For ages I was thinking that ARSY wasn’t exactly ‘affectedly creative perhaps’; of ourse, ARTSY was! 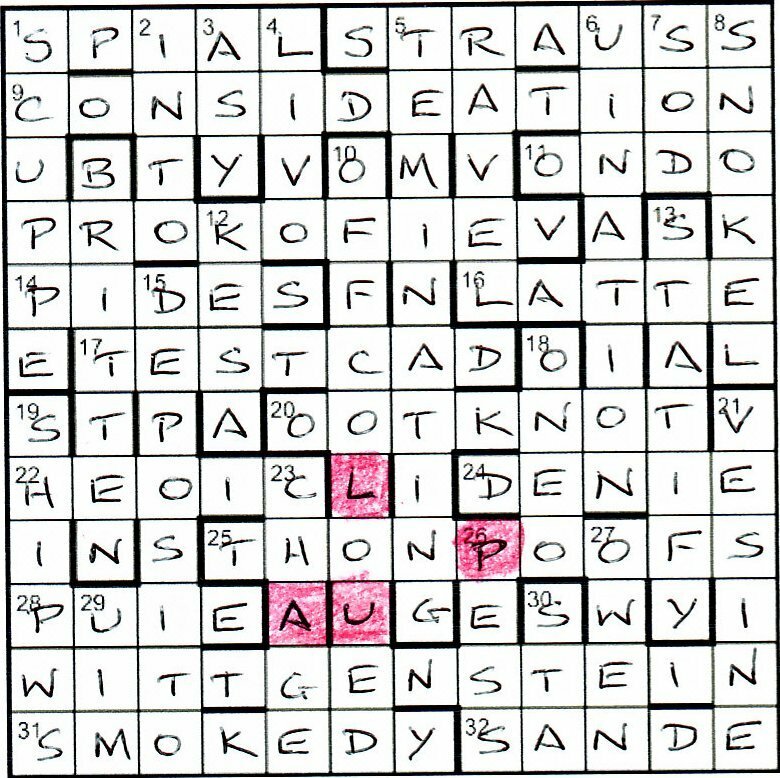 And so, on with this week’s puzzle, and it’s wonderful theme … GOLF. Unfortunately, it was pretty much carte blanche, with only two tees and two greens numbered. Clues were divided into four groups: Par threes, Par fours, Par fives and columns. At least the clues were numbered with their holes. I started with holes 1 and 10, but unfortunately RIOTERS and KINCOB eluded me. I should have got the first straight away, but alas I was trying to truncate RIO rather than TERSE. I decided to move on to the columns. I thought that working out the paths of the holes needed at least a couple of entries. 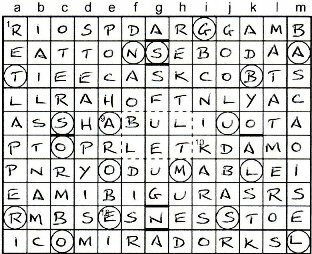 After all, clue 1 could have along the top row and onto the greens in columns f or g rather than down column c.
My first was c (upper), STORE. Needless to say, I didn’t get c (lower) until very late in the day, since the B-ROOM is not where I do any contemplating at all! I got a real kick-start with SYMPATHISE in column d, FUGUES in g, and KING COBRAS and BLOOD SUGAR in columns i and j. Although j read as an &lit, I’m not sure that Cerium has anything to do with blood glucose. At this stage, I realised that Artix was a setter to be treated with trepidation. Some of his clues were neatly devious. 14 Roman city paintings sent back with no latitude had me thinking of the Roman SCIPIO, the reverse of OIL PICS without the L! Was that a deliberate red herring, the correct answer being SARUM, ie the reverse of MURALS without the L. And as for 8 Homes must have two characters reflected in minuscule houses (with its timely reminder of how to spell miniscule)! That turned out to be ABODES -> AbOdES -> AdObES -> ADOBES. Tricky, or what? The grid probably took me something over four hours to complete. I’m not really sure, since I tackled it in several sessions over a few days. The thematic phrase was one we are all familiar with: STRONG AS A BULL MOOSE. A bit of Googling showed me that we were dealing with when the Dynamic young buck shot Roosevelt after expression of contrary vote. It seems that no sooner had Roosevelt uttered those words than John Schrank tried, but failed, to assassinate him. The BULLET lodged in Roosevelt’s chest and needed to be entered in the central lodge of the grid. So the theme wasn’t about golf at all! How disappointing. All that remained was to find the advice for golfers. I hoped that one would be “Keep up with the group in front, not just ahead of the group behind”. Or perhaps “Get rid of those long-handled putters; everybody knows they should have been made illegal decades ago”. Sadly, neither were there, but SPEAK SOFTLY [and] CARRY A BIG STICK were, words spoken by Roosevelt in a Chicago speech in 1903. An excellent Listener debut from Artix, despite its having a non-golf ending! A nicely deceptive title as well. I look forward to more from this setter. This entry was posted on 2 November 2012 at 5:00 pm	and is filed under Solving Blogs. You can follow any responses to this entry through the RSS 2.0 feed. You can leave a response, or trackback from your own site.